Release of the "X Ride" 115cc AT commuter model for the Indonesian market - News Releases | Yamaha Motor Co., Ltd.
Yamaha Motor Co., Ltd. announces the April 2013 release of the new "X Ride," an automatic transmission (AT) commuter model for the Indonesian market powered by a 115cc engine equipped with Yamaha's exclusive YMJET-FI* fuel injection system and featuring innovative new styling with an off-road image. Indonesia's motorcycle market scale is approximately seven million units (Yamaha Motor survey, 2012 results), about 60% of which is for AT models. In recent years, a new type of lifestyle is increasingly seen where users, especially males in the 20 to 30 age group, enjoy customizing their motorcycles to suit their personalities and thus use them as tools for self-expression. The new X Ride was developed to answer these market needs as an AT commuter model with an off-road image designed around the concept of a "New Show-Off Taste AT." The X Ride's engine features the Yamaha-exclusive YMJET-FI fuel injection system for excellent fuel economy and a pleasurable acceleration feeling. It also has sporty, innovative exterior styling and outstanding traction performance from the specially designed suspension and a wide rear tire (sized: 100/70-14). The coloring design features a combination of boldly colored body surfaces and parts accented with vivid colors that work together with the dynamic graphics using an "X" motif and more to highlight the model's "Exciting" image. Also, a wealth of genuine accessories and parts are available for customers to enjoy customizing the X Ride. This model is manufactured and marketed by group company PT. Yamaha Indonesia Motor Manufacturing (YIMM). 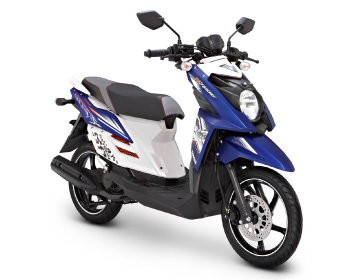 This is another new model that will contribute to the aim of "expanding business scale and increasing profitability" laid down in Yamaha Motor's new medium-term management plan announced in December 2012. *YMJET-FI (Yamaha Mixture Jet-Fuel Injection): A fuel injection system employing an auxiliary air intake passage besides the main passage to provide an “air assist” for more efficient mixing of the air and fuel that helps improve fuel economy in the practical use range.